Drop In Teacher Training Weekend #3: Already a yoga teacher but interested in refining your teaching? Join our teacher trainees this weekend to dive into your authentic voice as a yoga teacher. 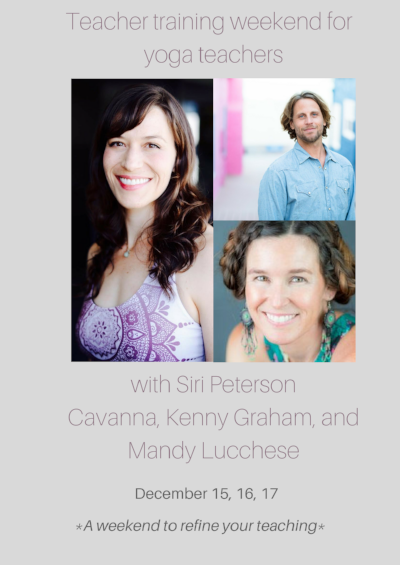 Mandy Lucchese, Siri Peterson, and Kenny Graham will discuss teaching meditations and pranayama, how to teach beginners, teaching and practicing inversions safely, and embracing your seat as teacher. Join us for all or for part; CE Units available. Space extremely limited.